The UK Border Agency now accepts Cambridge English: Advanced (CAE) as meeting the language requirements for all categories of UK visa, including Tier 4 student visas. The Australian Department of Immigration and Citizenship (DIAC) has also approved CAE for student visa applications. 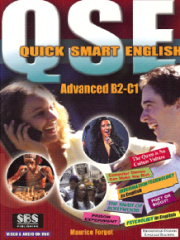 QSE Advanced is at C1 level and includes CAE (and IELTS) practice materials - ideal for students working towards CAE.